Update January 2011: Turns out that Nikon's original Still Video Camera (SVC) prototype was developed by Matsushita Electric (Panasonic). More info below the original article. 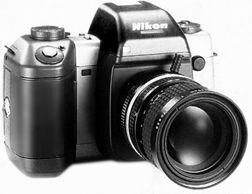 Photos of the original Nikon Still Video Camera (SVC) prototype are extremely difficult to find. In fact, I've only seen one before (what I assume is the official product shot to the right). Much to my surprise, I recently came across two more, printed in the Swedish magazine «Aktuell Fotografi», dated Jan/Feb 1987. As far as I know, this is the first time any of these photos are published on the Internet. Notice the «Nikon Viewer» unit, completely different from the QV-1010T transmitter that was included with the later QV-1000C kit. 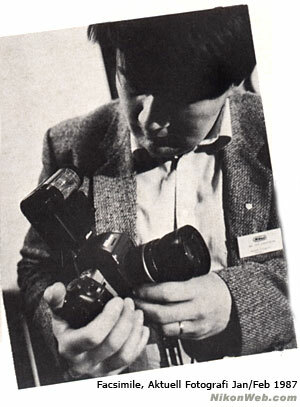 The Still Video Camera was first showcased at Photokina 1986 in Cologne, and was later shown to journalists visiting Nikon Europe in December. It was also on display at the Photo Marketing Association (PMA) trade show in Chicago in 1987. In December it was time for a new meeting in Amsterdam (where Nikon has its main European office). Proud engineers, headed by Mr. Kawahara, showed a prototype Still Video Camera, and a prototype four color transmitter. Despite the fact that Nikon can achieve 300.000 pixels, compared to Canons still video with 190.000, it's still not enough. - This is not good enough if the new technology shall replace the old. And the interest for the new still video camera wasn't overwhelming, while about 100 journalists and editors applauded the new transmitter. Improved image quality is Nikon's contribution to the development of the new technology. Future Nikon photographers using Nikon Still Video Camera (SVC), can chosse between "frame", allowing 25 exposures per disk, and "field" allowing 50 exposures (like other still video cameras) on a standard two inch diskette (the tiny casette that is used for storage is the biggest limitation - optical storage, similar to CD-ROMs, is a possible alternative for the new technology. Nikon SVC feels like a "real" camera. It mostly resembles a traditional Nikon, everything is located where it should logically be (Nikon is known for making cameras that "feels good in the hand"). You'll find shutter speed, aperture, exposure compensation and of course an automatic program, as in a regular Nikon. The only thing I'd like to see after spending half an hour with this prototype is - in addition to better image quality, of course - an improved viewfinder, perhaps an HP-finder (Nikon photographers are spoiled). Film sensitivity should also be improved. SVC has a sensitivity equivalent to 100 ASA. 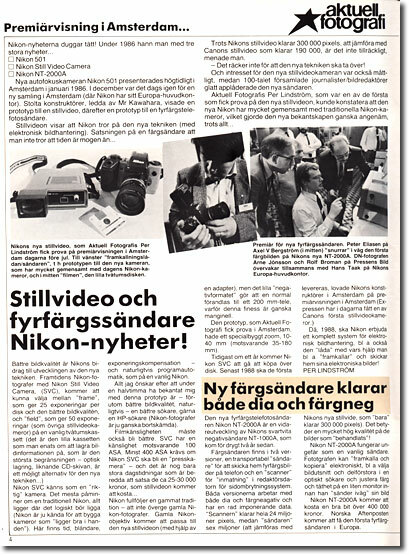 At least 400 ASA is required if Nikon SVC is to become a "press camera" - and it's likely that only large daily newspapers are prepared to spend the 25-30000 kronor (Swedish crowns) that the still video will cost. Nikon continues an old tradition - they will not surrender old Nikon photographers. Older Nikon lenses will fit the new still video (using an adapter), but the small "negative format" transforms a normal lens to a 200 mm telephoto, making this a marginal option. The prototype that Aktuell Fotografi tested in Amsterdam, had a special built zoom, 10-40mm (equivalent to a 35-180mm). In one year, at the soonest, the SVC can be found on the shelves. 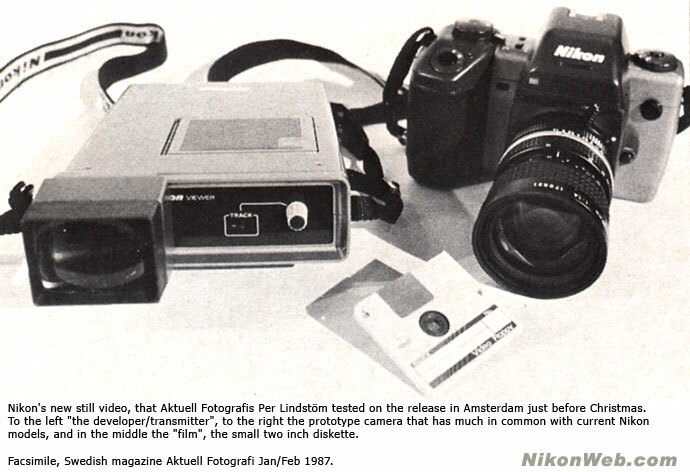 No later than 1988 the first cameras will be delivered, promised Nikon engineers in Amsterdam. Then, in 1988, Nikon will offer a complete system for electronic image workflow, including the "box" used to "develop" and transmit electronic photos. Original text printed in Swedish magazine «Aktuell Fotografi», Jan/Feb 1987. 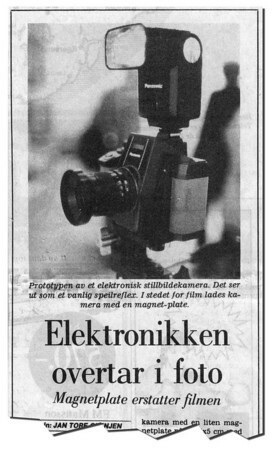 And then, putting all the pieces together, I found this Norwegian newspaper article from October 1984, describing how «Electronics take over photography - magnetic disk replaces film». The article is illustrated by - you guessed it - a photo of a Panasonic still video camera (apparently displayed behind closed curtains) at Photokina 1984.